The Racquet Club House was built in 1960 by the Alexander Building Company as a vacation home for busy city dweller. Located centrally in the historic Racquet Club Estates, it’s surrounded on all sides by other restored mid-century Alexanders for that true historic feel. The house just emerging from a year-long ground up restoration that updated all systems and features to meet today’s demanding requirements - making living in the desert an effortless and pleasant experience. 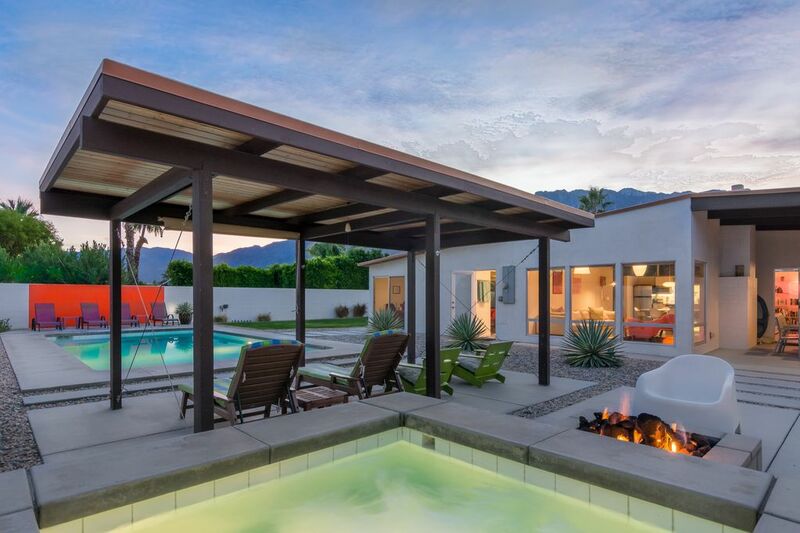 The house was also featured on the 2014 Modernism Week house tour as one of the top attractions. With a traditional Alexander layout it features 3 bedrooms and 2 bathrooms and sleeps 6 people in bedrooms configured with one king, one queen and two twin beds. All bedrooms have direct access, through sliding doors, to a large garden, patio and pool area – making for a great indoor/outdoor experience. The kitchen is of course all new with all stainless appliances and Caesar stone counter tops, and also features wonderful mountain views through the clerestory windows that fill the entire west facing wall of the living room and kitchen. Lovers of modern furniture will fill right at home in this house with a selection of original pieces from Eames, Nelson, Noguchi, Kartell, Marimekko and many other original manufacturer. The owner is a furniture connoisseur and is constantly on the hunt for new classic furniture to complement the design of the house. The living room features ample seating for enjoying pre-dinner cocktails while being cozy around the gas burning fireplace. Large windows towards the garden also bring light and outdoor views into the house – this really is modern indoor/outdoor living at its best. The outdoors presents many opportunities for relaxation – take a swim in the over sized pool with a built in tanning shelf (9” of water) or jump into the hot tub next to the outdoor gas burning fire pit for a late night star gazing session. A large shade structure shields you from the sun during the day once your tanning sessions are over. An outdoor shower makes rinsing off and getting ready for a night out in town easy and convenient – this is always one of the most loved features when guests visit. Least but not last, a nice sized lawn ads some color and a great place for playing with kids or just hang out. The entire house and garden is covered by a wireless network so getting your daily fix of internet news and updates is only a click away. A guest house is also on site but not available for rental as it’s exclusively used by the owner. Hello and thanks for checking out my house in Palm Spring. Having grown up in Denmark and not moving to the US until later in life, you could probably argue that I should be a natural lover of modern design - which exactly is what I am. This is the third Alexander that I have owned in Palm Springs and by far the best. I work in tech and live in Silicon Valley, so having the ability to escape to Palm Springs for a long weekend of fun is something that I really appreciate. I have known about mid-century homes in Palm Springs for many years, but it wasn't until about 5 years ago that I decided to buy my own house in the desert. It obviously grew on me and after having previously restored two other Alexanders I have now just recently completed this one. I am a bit obsessive when it comes to quality and have spent far more on this house than I would have done had it just been a quick flip since I'm planning on keeping it for a long time. There is an outdoor shower with hot & cold water in addition to indoor bathrooms. Just a short drive from our vibrant downtown scene, you can satiate your craving for action... after all that relaxing. Spectacular San Jacinto Mountain views. Mount San Jacinto stands 10,834 feet above sea level, and is the second highest mountain range in Southern California. Front loading stackable. Located inside the home for your convenience. Gas burning fireplace for those cool winter evenings. Wifi for all your business or streaming needs. Plenty of towels & pool towels provided. Open floorpan with abundant natural light. Custom roller shades to keep out then light if you prefer. Beautiful mountain views from the living room. Fully stocked kitchen with plates, utensils, cups & pans. Outdoor plasticware as well. All stainless steel appliances. Stocked with all the essentials for entertaining. Multiple dining areas, indoor (kitchen) or outdoor covered patio by the grill. Over the air channels + set up with streaming Netflix, YouTube, Pandora and other internet apps. Harman Kardon stereo with B&W high end speakers. Please note the stereo is for indoor use only, all music is prohibited outside at a Vacation Rental property at all times of the day. Lush grass & desert landscaping. Outdoor dining for 6, conversation areas & several lounge chairs to relax in. Located near Ruth Hardy Park. Play structures, 8 public tennis courts, 3 sand volleyball courts, picnic tables, basketball court & tot lot. With a built in tanning shelf. Optional pool heating when needed (additional Fee). Majestic mountains views while you relax. Fully automated, just turn a dial. Great house, location, views, décor and amenities. No sign or sound of chimps during our stay. Would definitely rent again... LOVE the mid-century!! Thank you for sharing your beautiful home. Great house. Nice location. Quiet neighborhood. Loved the house. Kids thoroughly enjoyed the pool. Great jumping off point to Joshua Tree and the Palm Springs Tram. Lots of grocery stores and restaurants nearby. I would upgrade to a "smart TV" for Netflix and Amazon Prime, and handheld shower heads would be good. Palm Springs water pressure is not adequate for washing kids hair. We had a wonderful week staying in this home. The home is exactly as pictured on the VRBO page. We were just two, but this would be perfect for four people. Six or eight might be a squeeze because of 2 x .75 bathrooms. This home is slightly larger than other Racquet Club Estates homes - with an extra living space. Appliances are new, with a gas range. It was easy to cook in this kitchen (it is more updated than other similar homes we've rented in this neighborhood), with good-quality tools and staples on hand. The home was very clean, with no trace of past renters. The house manual is very clear with instructions on how to use everything. Do not miss out on using the private, outdoor shower behind the casita. It was one of our favorite amenities, and we didn't use the indoor showers once we discovered it. The location is great - close to Palm Springs - but in the winter (when we visited - mid-November), the sun sets very EARLY. It was gone by 3:30, and it was dark just after 5pm. We did pay for pool heating, and were happy we did. It was high 70s/low 80s during our visit. Great house. Exactly as described and presented. Wife and I loved our stay. Private backyard with pool, hot tub and fire pit were a great place to relax. Views both day and night are amazing from the back yard and inside the house. House was equip with everything you need and more. Great house in a convenient location. Perfect place! My family and I felt comfortable and relaxed. The property is absolutely gorgeous with a modern design aesthetic and well-maintained pool. All of our needs were covered and the booking process was easy. Beds were comfortable, very CLEAN, and nice shade on the patio. I'd definitely recommend for a couple's getaway or ladies weekend! Destinations within 2-3 hours' drive: Disneyland, Sea World, San Diego Zoo, Legoland, Knott's Berry Farm, Santa Monica Pier, Venice Beach, Los Angeles, Malibu, Hollywood, Universal Studios, San Diego, Orange County. A Palm Springs ordinance requires that you must be 25 years of age or accompanied by a legal guardian. ID may be requested at time of arrival. No events, parties or gatherings. Security deposit is 750.00 (refundable) There is a $50+tax a day optional pool heating fee available (when needed) Minimum stays may vary over events & holidays The Palm Springs Vacation Rental Ordinance requires the following: All persons must be at least 25 years of age or accompanied by parent or legal guardian. The maximum number of guests shall not exceed posted limits. Outdoor music of any kind or excessive noise is not permitted at any time. No more than 1 car per bedroom is allowed per home. 3 car maximum. Failure to do so can result in fines being issued directly to the occupant of the home. Please refer to your rental agreement or ask for greater detail.